In one of the more bizarre and severe instances of restrictions placed by the state on family contact, a court-appointed guardian has banned family members of an intellectually disabled woman from all contact with her because they allegedly became too emotional when they visited her. The 28-year old woman, Chelsea Barr, is dually diagnosed with intellectual disability and mental illness. Chelsea’s father, David, and sister, Ashley, have not even been told for almost a year where she is living. Clinicians in at least one hospital said the family was to blame for signs of agitation and psychotic symptoms allegedly shown by the woman after the family visits. The ban on family contact was imposed after Chelsea alleged that she had been sexually assaulted by the alleged boyfriend of her mother over a two-year period from 2012 to 2014. Chelsea’s mother, Nancy Barr, and her alleged boyfriend, John Leone, have both been arrested and are facing trial in Salem Superior Court in connection with the alleged assaults. In addition to banning Leone and Nancy Bar from visiting Chelsea, a guardian with the Department of Developmental Services last Thanksgiving extended the prohibition to other family members and a family friend, who have not been implicated in the alleged crime. The only family member who is currently allowed to visit Chelsea is a maternal aunt, who Ashley Barr said had little prior contact with Chelsea and maintains little contact with either Ashley or her father. 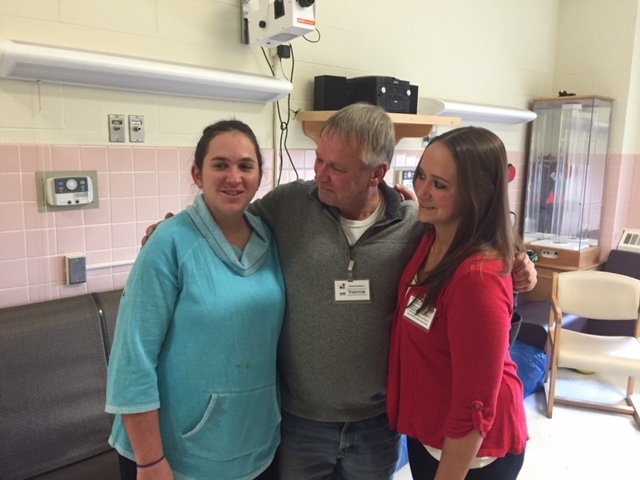 Chelsea (left), David, and Ashley Barr at Tewksbury State Hospital in October 2015. It was the last time that David and Ashley were permitted to visit Chelsea. David and Ashley have tried for months to get answers from the Department of Developmental Services and from the Department’s court-appointed guardian for Chelsea, and have gotten little information from them. They have gone to their local legislators and gotten little help, and have even gone to the media, but have been unable so far to get any news outlets to report their story. Neither David Barr nor any other members of Chelsea’s family, other than her mother, are alleged to have known about the alleged sexual abuse while it was happening, and none have been charged or implicated in the crime. David Barr was divorced from Nancy Barr in 2003. During the period of the alleged assaults, Chelsea had been under the care of her mother and had been living in her mother’s home. David Barr said that Nancy Barr has also been diagnosed with mental illness. After Chelsea told a family friend about the alleged abuse in 2014, the friend reported the matter to police, and Chelsea was immediately removed from her mother’s care. She was apparently placed in a shared living arrangement in Haverhill, but that location was not disclosed at the time to any other members of the family. In the months that followed, the family was only sporadically informed about Chelsea’s whereabouts. Chelsea’s sister Ashley and her father said that virtually no information was provided to them for the first month after Chelsea’s removal. They were then allowed to visit her only a handful of times, either at a DDS area office or in Massachusetts hospitals to which Chelsea was admitted, reportedly after psychotic episodes. Ashley Barr currently lives and works in Rhode Island. Last Thanksgiving, the DDS guardian, Dorothy Wallace, a psychiatric social worker, terminated all family contact with Chelsea. Ashley said she and her father have not been permitted to visit or call Chelsea for nearly a year, and they don’t know where she is currently living. Wallace, the DDS guardian, has declined to speak with COFAR regarding the case. In statements she provided in probate court in August 2015, she said she ordered that the family’s contact with Chelsea be restricted at that time because Chelsea’s father and sister would become overly emotional during visits with her. Wallace said clinicians in various hospitals in which the visits took place complained that Chelsea would be agitated and upset after the visits and that her symptoms of bipolar disorder would then become aggravated. Wallace and Jill Casey, Chelsea’s DDS service coordinator, testified in the August 2015 probate hearing that their goal was to reunite Chelsea with her family once she was “clinically stabilized.” However, as of October 2016, more than a year later, the family has received no word from DDS as to when or if such a stabilization has occurred. Ashley Barr said her calls and text messages to both Wallace and Casey have gone unanswered. Ashley acknowledged she and her father did become emotional at times during visits with Chelsea because she appeared upset at being kept isolated from them and often appeared to be over-medicated. In one of the last instances in which they were allowed to visit Chelsea, Ashley said it appeared she had not been bathed. Ashley personally gave her a shower at the hospital. Her hair was so dirty and matted, Ashley said, that she had to use an entire bottle of shampoo and conditioner to untangle it. Like many probate cases, this case has a complex history. David Barr has tried without success to gain guardianship of Chelsea following his divorce from her mother. In early 2015, the Essex County Probate Court passed over David Barr and a long-time family friend, who had offered to be Chelsea’s guardian, and instead appointed Wallace, the DDS-paid psychiatric social worker, who had never met Chelsea, as her guardian. David Barr said he would have supported the family friend as Chelsea’s guardian, but “we were totally ignored.” Barr has since filed a new petition for guardianship in probate court. Ashley added that her father was not liked by some of the staff of Chelsea’s day care provider agency because he would become angry and reprimand the staff following several instances in which Chelsea walked out of the provider’s facility unattended. Then, in November 2014, Ashley was contacted by Jill Casey, the DDS service coordinator, who said she would be allowed to visit Chelsea at the DDS area office in Lawrence for about an hour. David was not invited to that visit. Ashley said she was told during the visit not to ask Chelsea any questions about where she was living. She said Chelsea “looked scared,” and said several times that she wanted to see her father and to come home. A family friend, who was allowed to visit Chelsea around this time, said Chelsea was living in a home in Haverhill owned by a woman who had two or three other developmentally disabled persons living there. The friend said she was instructed not to tell anyone in Chelsea’s family where Chelsea was. The friend said she was allowed on one occasion to take Chelsea out of the Haverhill home for the afternoon. Chelsea was upset, she said, because she wanted to see her family. She also wanted to sleep over at the friend’s house, but that wasn’t permitted by the guardian. It wasn’t until April 2015 that Ashley was next allowed a visit with Chelsea – this time in Arbor Fuller Hospital in Attleboro, where Chelsea was scheduled to celebrate her 27th birthday. Ashley said she was allowed a number of visits to Arbor Fuller, and David was allowed to visit as well, though a lesser number of times. It was apparently at Arbor Fuller, that Ashley and David first reacted too emotionally when they saw Chelsea. During the probate court hearing, Wallace, Casey, and Barbara Green Whitbeck, a DDS attorney, repeatedly stated that they considered it necessary to “educate” David, Ashley and potentially other family members about what was in Chelsea’s best interest and the extent of her mental illness. In June 2015, Ashley found out from her aunt that Chelsea had been admitted to Lawrence General Hospital because her psychiatric symptoms had flared up. Ashley was subsequently allowed to visit Chelsea a handful of times at Lawrence General, but David wasn’t, for reasons that were not provided to them. After a short stay at Lawrence General, Chelsea was admitted to Tewksbury State Hospital. Ashley said that when she was living in Connecticut at that time and drove up to Massachusetts several times a week to visit Chelsea. Chelsea’s father was finally allowed to visit her at Tewksbury State in October 2015. Chelsea appeared drugged during that visit as well, according to Ashley. And that was the visit in which Ashley said she needed to use an entire bottle of shampoo and conditioner to untangle her hair. Ashley did manage to see Chelsea without permission at Tewksbury State in December when she visited under an assumed name. She gave her Christmas presents during that visit. It was the last time she would see Chelsea. 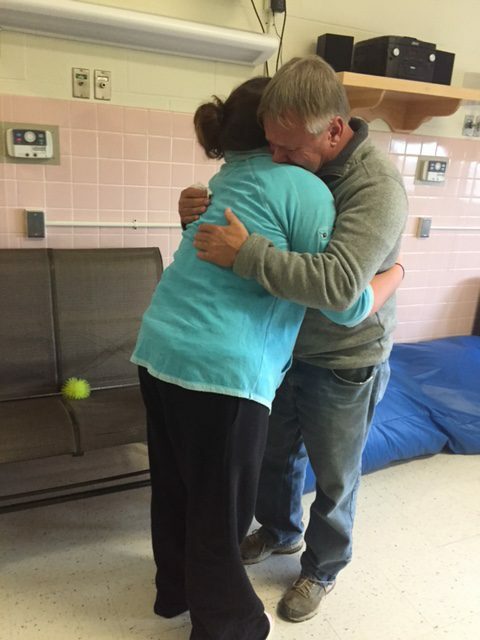 Chelsea and her father hug good-bye at Tewksbury State Hospital. In May, Ashley found out she was pregnant and learned that she was going to have a girl. She contacted the guardian to ask whether Chelsea would be allowed to come to the baby shower, which was planned for a restaurant in Andover. She said Wallace denied the request and told her Chelsea would not be informed that she was pregnant. The family friend who initially reported the alleged sexual abuse of Chelsea to police had initially been allowed to visit Chelsea, as noted earlier. However, when the friend tried to visit Chelsea at Tewksbury State in April on her 28th birthday, she was told that Chelsea was no longer there. The friend said she was also told by a staff member at the hospital that she too had been placed on a no-visitor list. She said she was not given a reason for that prohibition. The friend said she understood that the only family member still allowed any contact at that point with Chelsea was the aunt, who had previously had little to do with her. Ashley said David did hear from Chelsea one last time in July when Chelsea apparently managed to find a cell phone and called him. She said the cell phone had a New Hampshire area code, but that Chelsea did not know where she was. The call was terminated after two or three minutes, she said. When we at COFAR heard about this case, we contacted the office of David Barr’s local House member, State Representative Linda Campbell Dean. Both Ashley and the family friend had previously contacted Dean’s office, but a staff member in the office indicated at that time that the office could do little to help them. When we contacted Rep. Dean’s office earlier this month, the staff member did offer to contact DDS on behalf of the Barrs. The staffer reported back that DDS would not discuss the case with Dean’s office, but would pass along Dean’s concerns to others in the Department. You can contact Rep. Dean’s office at 617-722-2430, or send an email to Linda.Campbell@mahouse.gov, and urge them to continue to try to work with DDS to resolve this case. In addition, you can contact Governor Baker’s office at 617-725-4005; and DDS Commissioner Elin Howe at 617-727-5608; or email: elin.howe@state.ma.us. Say you believe David and Ashley’s visits to Chelsea should be restored immediately. Also, let them know that you hope and expect that as part of their review of the case, DDS officials will contact and interview both David and Ashley. David and Ashley Barr have also launched a GoFundMe appeal for funds to hire an attorney to represent them in probate court. You can find their petition and contribute to it at https://www.gofundme.com/helpchelseaB.